It was just the kind of wartime story that made an emotional impact on Milwaukee and the state of Wisconsin. Three Irish brothers serving in World War II appeared together to promote the sale of war bonds at a series of rallies in November 1944. Two were home on leave from the front and one was about to embark on his first overseas tour of duty. There they stood on stage, the baby-faced Thomas “Tinker” Mulqueen still in naval training, the serious Marine Cpl. Earl J. Mulqueen Jr., on crutches due to the loss of his left leg above the knee, and the curly-haired redhead, Patrick J. Mulqueen, home from more than 18 months at sea with the U.S. Navy. 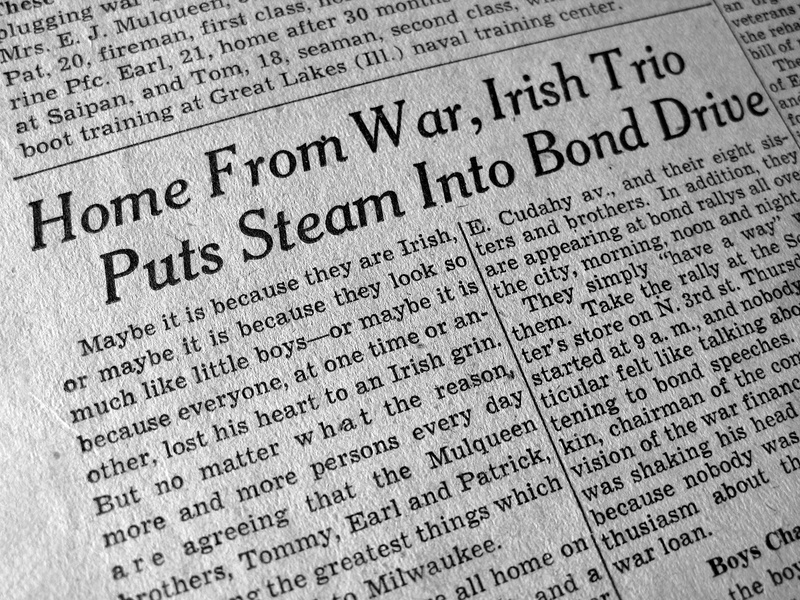 The Milwaukee Journal carried a front-page story on the Mulqueen brothers and the war bond drive in November 1944. 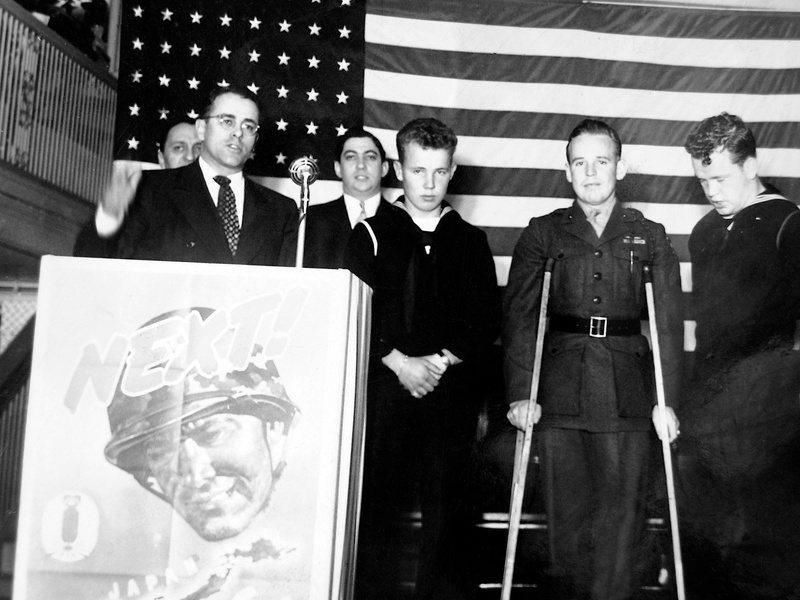 Three Mulqueen brothers appear at a Milwaukee war bond rally in November 1944. Left to right are Michael Thomas Mulqueen, Earl James Mulqueen Jr. and Patrick Joseph Mulqueen. Behind the group is war bond chairman Ben Barkin. Earl talked about the war. At 21, he had seen more fierce combat than most would ever see. He fought at Guadalcanal and Tarawa with the 2nd Marine Division. 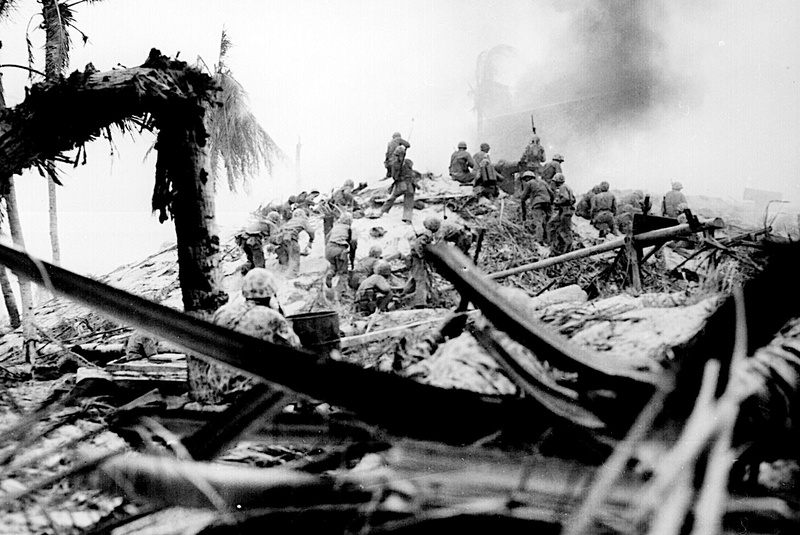 Those were two of the bloodiest, deadliest battles of the entire Pacific war. 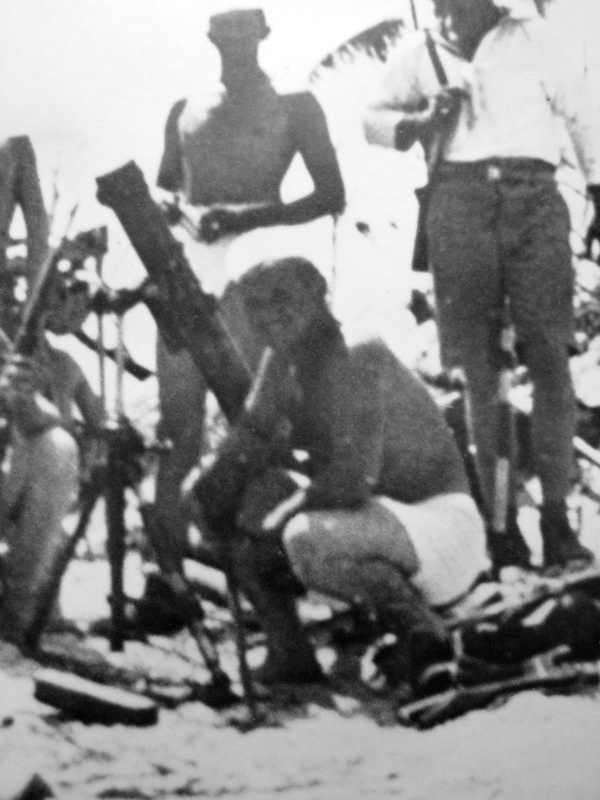 Earl was a mortar crewman, so he was right at the front. This hazy snapshot from the Pacific shows U.S. Marine Cpl. Earl J. Mulqueen Jr. next to the mortar he took into combat during World War II. Patrick spoke of his experience as a fireman aboard the light cruiser USS Concord (CL-10). He enlisted on August 7, 1942 and by March 1943 was among the compliment of 700 aboard the Concord. The ship escorted reinforcement convoys in the southern Pacific, and prowled the dangerous, icy waters of the north Pacific. The Concord was involved in numerous bombardments of the Kurile Islands. During 1943, the Concord was on a surveying mission of the South Pacific with retired Rear Admiral Richard E. Byrd, the famous explorer. 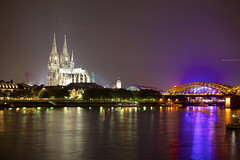 The ship visited Tahiti, Bora Bora and the Easter Islands. A huge explosion onboard on October 7, 1943 took the lives of 22 crewmen. Caused by ignition of gasoline fumes at the rear of the ship, the explosion threw some men overboard, while others were killed from concussion, burns, fractured skulls and broken necks. On October 8, those men were buried at sea. After participating in bond rallies in Milwaukee, Patrick was assigned duty on the USS Crockett (APA148), a Haskell class amphibious attack transport. The USS Crockett had just been commissioned on November 28, 1944. The crowd at Schuster’s quickly figured out that these “boys” had seen and experienced the horror of war. “It was simple and short,” The Journal wrote. “No frills. No hero stuff, no dramatics—nothing but a couple of kids, one on crutches, asking people to buy and sell bonds.” The stories of the Mulqueen boys had the desired effect. Barkin exclaimed, “You know, the bond drive is going to come out all right.” He was right, for the Schuster’s bond drive raised more than $500,000. 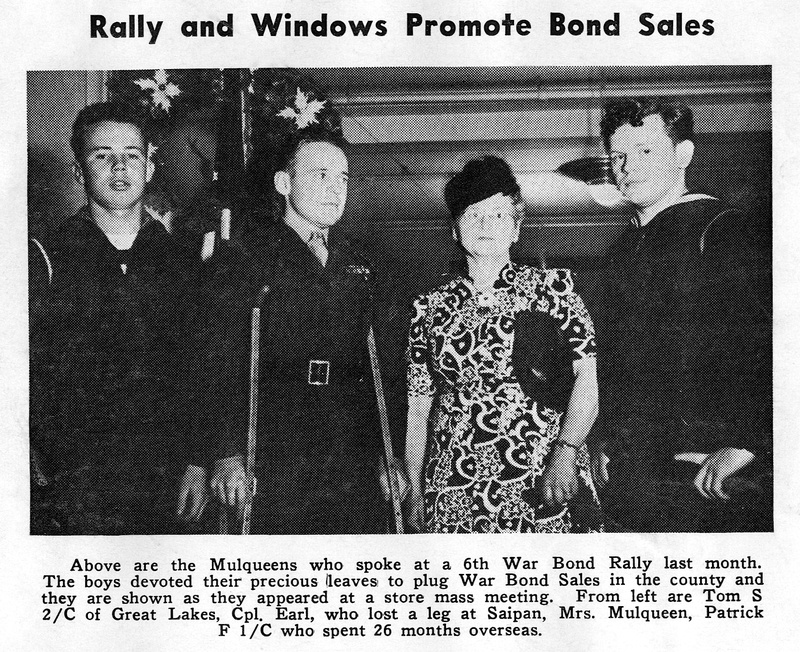 The Mulqueen brothers even appeared at war bond rallies with their mother, Margaret Mulqueen, who was active in the Marine Corps League. 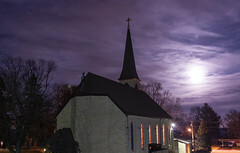 Schuster’s was just one of many venues at which the Mulqueen boys spoke. At some rallies, they were joined by their mother, Margaret “Madge” Mulqueen, who was deeply involved with the war effort through the Wisconsin chapter of the Marine Corps League. She had four blue stars displayed in the window of the Mulqueen home at 3854 E. Cudahy Avenue in Cudahy — one for each of the three boys and one for her daughter Margaret, a Navy nurse based in San Diego. The bond drives were a crucial part of the home-front effort in World War II. Across the nation, eight war-bond drives between 1942 and 1945 raised more than $190 billion. Investors purchased $25 bonds for $18.25. Bonds were redeemable after 10 years. Companies sponsored in-house bond rallies, and employees pledged purchases through payroll deduction. Children were encouraged to buy 25-cent war stamps to save up for their own war bond. Special sections of local newspapers were dedicated to promoting bond sales. On the radio, popular programs such as Fibber McGee and Molly dedicated entire episodes to war bonds and other home-front efforts. Sgt. Louis C. Koth (left) and Marine Cpl. Earl J. Mulqueen Jr. are introduced by company president Earl W. Wyman at the Oshkosh B’Gosh Inc. bond rally on November 30, 1944. Earl Mulqueen and Army T/Sgt. 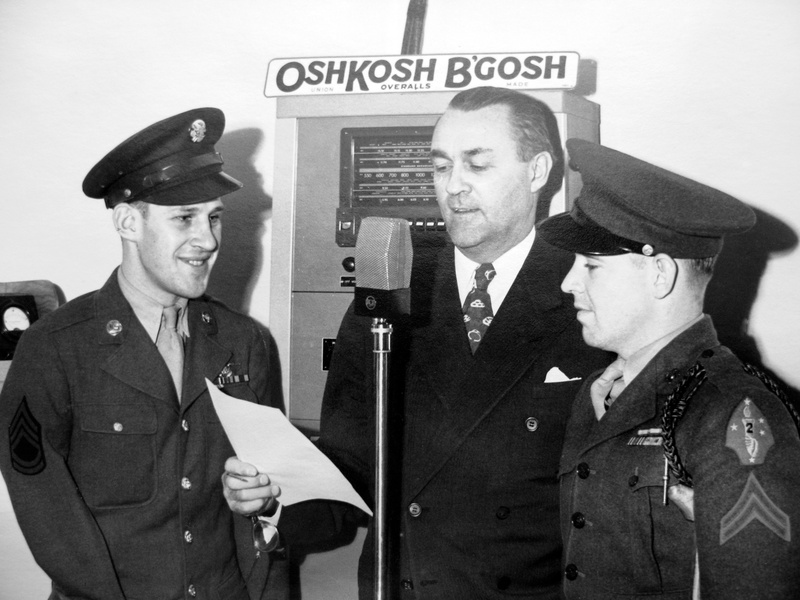 Louis C. Koth appeared at such a corporate event at Oshkosh B’Gosh Inc. on November 30, 1944. They were introduced by company president Earl W. Wyman. Koth was a radio operator aboard a U.S. Army Air Force B-17 bomber that was shot down during a mission over Schweinfurt, Germany. 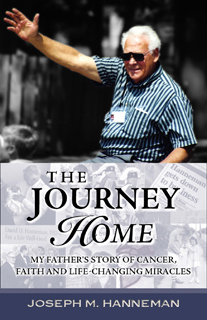 Koth was on his third mission in a B-17 Stratofortress when he was forced to parachute into enemy territory. Taken prisoner and repatriated 11 months later, Koth lost his right arm. 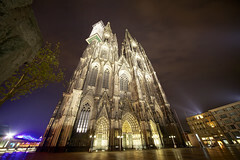 Koth began participating in the bond tours shortly after being released from a hospital in Madison in the fall of 1944. The bond rallies helped explain the costs of supplying the troops. Toothbrushes cost 8 cents each. A hand grenade was $1.56. An anti-tank shell cost nearly $3. A Garand rifle was $55. A 1,000-pound bomb cost $250, while a 75-mm Howitzer cost $11,350. A PT boat cost the military $145,000, while a 1,630-ton destroyer had a price tag of $10 million. A fully outfitted battleship cost $97 million. Bond drives supplied the U.S. government with needed cash, while giving ordinary citizens a concrete way to participate in the war effort. 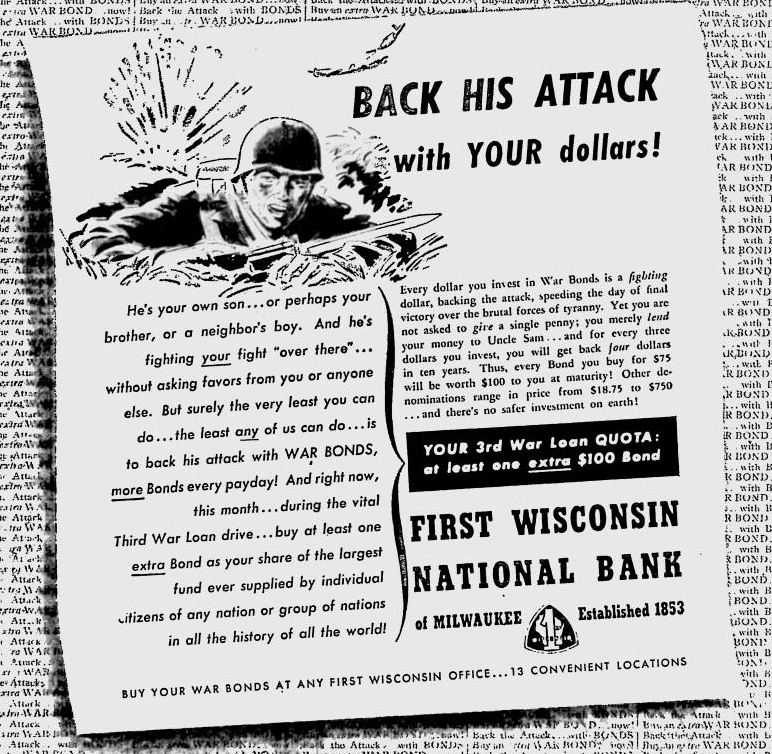 Ads like this one from First Wisconsin promoted sale of war bonds during World War II. Largely due to Barkin’s tireless efforts, Milwaukee’s World War II war-bond drives became a model for the nation. Described by The Milwaukee Journal as an “ace ward bond salesman,” Barkin was honored as Milwaukee’s man of the year in 1945 by the Milwaukee Junior Chamber of Commerce. For his $1 annual salary, Barkin popped up just about everywhere in Milwaukee: schools, churches, civic clubs and businesses. 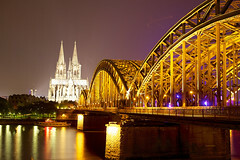 The 28-year-old was unable to enlist due to a disability, so he threw his energy into raising money for the war effort. Doctors told him to slow down, but the pitchman didn’t listen. He gave more than 1,000 speeches each year as head of the community division of the war finance committee. 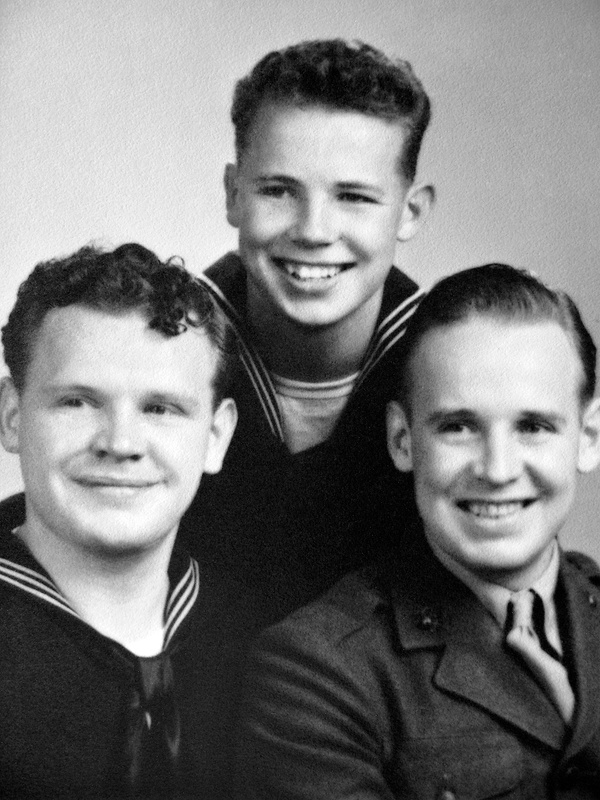 Three Mulqueen brothers served in World War II: Patrick (left), Thomas (center) and Earl. So Barkin knew when the Mulqueen boys stepped on stage, the people would dig deeply into their pockets to support the war. “No matter what the mood of the meeting before the kids talk,” The Journal wrote, “when they finish, that meeting is sure of going over the top.